John Stewart Rutherfoord of Bridge of Allan studied medicine at the Royal College of Surgeons, Edinburgh and after examination in Anatomy, Surgery and Pharmacy, received his Licentiateship to practice on the 24th March 1829. This was exactly one month before his 21st birthday. I would urge you here to take heed of the date that John Stewart gained his Surgeon’s Licentiateship: the year 1829. You may be flabberghasted to learn why! Please read on. This daughter was later traced in the 1841 census to Millrow Dunblane, a few doors down from her Aunt – dear Susannah Rutherfoord. In 1850 Margaret Stewart Rutherfoord and her husband left for Australia. It was their daughter who retold stories of her grandfather ‘the doctor.’ Easily the most fascinating of her recollections placed Dr John Stewart Rutherfoord amidst the gruesome and murky shenanigans of Burke and Hare. This placed extraordinary circumstance & Bridge of Allan in a bond hand-to-hand: for Robert Louis Stevenson was inspired by the true story of Burke and Hare to write The Body Snatcher. It was as a sickly youth, that Robert Louis Stevenson used to regularly visit the Strathallan Pharmacy in Bridge of Allan once served by the doctor and his apothecary brother. The West Port murders were perpetrated between 1827 and 1828 by William Burke and William Hare who sold the corpses of their 16 victims to the Edinburgh Medical College for dissection. Their principal customer was Edinburgh doctor Robert Knox. Before 1832, there was little legitimate supply of cadavers for the study and teaching of anatomy in British medical schools. As medical science began to flourish in the early 19th century, demand rose sharply and attracted criminal elements that were willing to obtain specimens by any means. The activities of body-snatchers gave rise to particular public fear and revulsion. Burke and Hare returned later that evening with the corpse and went to see the three young men, who instructed them to bring the body up the stairs and lay it on the dissecting table, which they did. At this point Dr Knox entered and told his assistant to settle with them and named a price of £7 10s; and he also did not ask where the body came from. They were bid farewell and told that they would be glad to see them again when they had other bodies to dispose of. So Burke and Hare returned to their partners to celebrate and tell the tale of their night’s endeavour. This first meeting with Burke and Hare occurred at a time when Professor Knox was at the peak of his Anatomy career and he had over 500 students in his domain, including the young John Stewart Rutherfoord. At the time of the murders, John Stewart Rutherfoord was approaching the end of his training. Students, such as John Stewart, aspired to the distinguished and lofty Professor. They indeed stood in awe of him and oft sought his counsel. Body snatching was not new and as early as 1738 there are recorded accounts of the recently departed being removed to be dissected on the slabs of the Edinburgh Medical Schools. But as the Study of Anatomy surged forward in Edinburgh in the early 1800’s, it was apparent that the allowed allocation of one executed criminal per year to each Anatomy School was insufficient for the growing amount of students. St Cuthbert’s, west of Edinburgh Castle and one of Edinburgh oldest churches, became the hunting ground for body snatchers who by lantern light at the witching hour performed their grisly deeds. But these acts were not just done for profit; students of anatomy in their quest for knowledge also turned a hand to grave robbing. This became so common the locals ironically nicknamed the people who undertook these horrific deeds ‘Resurrectionists’. I cannot help wondering if the young John Stewart Rutherfoord was part of that Resurrectionary fabric? All the more reason that after graduating in 1829 – and a year after the hoo-ha of the Body Snatchers – that he took off, positioning himself on a ship as it’s doctor. By this means he would have escaped the scandal, allowed memories to fade, and only then have returned to Bridge of Allan. So rife was the Body Snatching in Edinburgh that certain graveyards had large walls, railings and watchtowers erected, such as St Cuthberts and that of the Canongate Kirk. Some graves had added protection against the exhumation of their occupants by having their own walls and railings. So horrified were the general public of Edinburgh. With the growing demand of the anatomy schools and the growing difficulty in obtaining freshly interred cadavers enter Burke and Hare, who devise their own and even more sinister methods of supplying the needs of the medical students. William Burke and William Hare, two Irish immigrants from Ulster, came to Edinburgh to work as labourers on the then New Union Canal and took up lodgings with Maggie Laird and Nell MacDougall, women of low virtue, in the sleazy district of the West Port (near Tollcross). Although giving the appearance of two hard working men by day, at night they had taken up their more sinister and profitable trade of grave robbing and then of serial murder. Their victims of murder were the waifs and strays of the streets of Edinburgh’s Old Town, people no one would otherwise necessarily miss. By hanging out in Inns such as the White Hart in the Grassmarket they would try and spot their potential victims and lure them to their death by their own form of strangulation (in order not to damage the corpse). Joseph Miller was the first to actually be murdered, he was known to Hare and had been lodging with him for some time and when he went down with a fever the Hares gave him a drink. They felt that he was clearly dying as the old man could not speak sometimes and there were rumours abroad of other fever cases. This worried the Hares as it might cause a loss in their business. So to show no sign of violence Burke took a small pillow and placed it over Joseph’s mouth and Hare lay across his body to pin down his arms and legs. His body was then transported to Dr Knox. The next victim was possibly an Englishman from Cheshire who was staying a few nights with Hare and became ill with jaundice. His name was unknown to Burke but he said he was ‘about forty’. Burke and Hare held him down and murdered the victim by getting the thumb under the chin and pressing down on the nose hard with the first two fingers thus stopping the victim from breathing. The third victim, an old lady from Gilmerton, was decoyed in by the Hares and eventually got drunk. Then Hare placed his hands on her mouth and Burke lay across her body. She never stirred. The pair went to Surgeons Square where they again met the three gentlemen and told them they ‘had another subject’. Dr Knox ‘approved of it being so fresh, but did not ask any questions’. 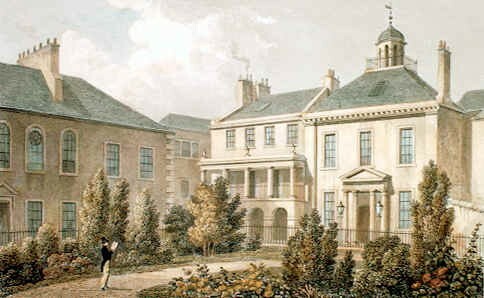 The next murder was not committed at Tanner’s Close, but in Gibbs Close in the Canongate at Constantine Burke’s house, William’s brother who by this time was also living and working in Edinburgh with his family. Burke met Mary Patterson, a beautiful teenage prostitute and her friend Janet Brown in a drinking den and invited them back to his lodgings. Mary became stupefied with drink and lay helpless upon the bed, her friend on the other hand ‘kept her head’ and excused herself and went to a friend of hers Mrs. Lawrie. Mrs. Lawrie sent her back to the house with her maid to collect Mary, but on their arrival Burke and Mary were no longer present and instead they met Hare and his wife. They invited them for a dram to wait for Mary and Burke’s return. So they sat and drank but unknown to Janet, Mary lay a few feet away, dead and naked, covered with a sheet. The maid returned home and explained the situation. Mrs. Lawrie sent the maid back and demanded Janet remove herself from the house immediately. This act probably saved Janet’s life because had not the maid returned she would also be dead and packed in an old tea chest ready to be delivered to Dr Knox. When Burke and Hare arrived with the body, one of Dr Knox’s students remarked that he had seen a girl similar to her in the Canongate. Burke dealt with this by saying he had bought the body from an old hag in the Canongate and that Mary had drunk herself to death. Some of the students drew pictures of her and a local artist was brought in by Dr Knox to record her beauty and well shaped body. This special subject was not dissected immediately but was put in spirits for three months to preserve her. Janet Brown loyally continued to ask and search after her friend Mary Patterson for many months to come. Over the next three months Burke and Hare became even bolder, even taking the bodies to Dr Knox during the day. These ruthless murderers went on to kill a further 10 victims, including a grandmother and her 12 year old grandchild and even a distant relative of Helen MacDougal. At about this time Burke and his partner moved out to his own premises in his cousin’s house. These two houses became the killing grounds for these poor people, but now we come to their last two victims. These would ultimately lead to the end of their sinister partnership. Jamie was a simple-minded 19 year old youth who was described as being big and strong but had the mind of a child. His adult tastes were confined to snuff, a habit for which he carried a brass snuff box and spoon; the latter he called ‘the days of the week’ due to it having seven holes in it. Jamie fled his family home after a disagreement with his mother and went to live on the street and survived by doing odd jobs like unloading carts and getting charity from people who took pity on him, but then he met Burke and Hare. Burke’s official confession states that Hare’s wife brought him off the street for a drink while Burke was at a local shop having a dram. Once he was in the house and in the company of Hare she came across the street to Burke and stamped on his foot. He immediately knew what she meant. He went back to the lodging house and they invited Jamie to the smallest room in the house and advised him to lie on the bed. Then Mrs. Hare left the house and locked the outside door. Hare lay next to Jamie on the bed for some time but then suddenly jumped on poor Jamie. They struggled and fell to the floor and at this point Burke caught hold of his arms and legs and they both held him until he was dead. Burke said Jamie was very anxious and kept asking for his mother, he was told she would come soon. Hare took Jamie’s snuffbox and Burke his spoon. Apart from the child, this must have been the most horrific of the murders because Jamie was sober and must have known what was happening to him. When the body was unpacked, several students recognised Jamie. Dr Knox denied it was him, but later when Jamie’s presence was missed on the street, he quickly ordered his dissection. On Hallowe’en, Burke was in a local tavern having a drink when an old lady came into the shop begging. Burke talked to her and discovered she was Mary Docherty and had come from Ireland in search of her lost son. Burke deceived her into thinking he was a distant relative and invited her back to his house. Burke left her there in the company of MacDougal while he went out to buy whisky for the Hallowe’en party he had planned and to inform Hare of another likely victim. They had a fine party that night, with lots of dancing and drinking. At the time Burke had an ex-soldier by the name of James Gray and his family staying with him. Burke asked if they could stay with Hare that night so the old woman could use their room, and they agreed. Mrs. Gray returned in the morning to find Burke acting very suspiciously, and he stopped her going over to the bed to collect her child’s stockings. Later that day Burke went out to get more whisky. Soon after the house became empty Mrs. Gray went over to the bed and lifted a pile of straw and uncovered the naked corpse of Mrs. Docherty, bloodstained around the nose and mouth. MacDougal returned to the house and begged Mr. Gray who had entered the room not to inform on what he had seen and it would be worth £10 a week. Mrs. Gray, shocked by her discovery, said “God forbid that we should be worth money for dead people” and they went to inform the police. Burke and Helen were taken to the police station and interviewed. At about the same time a tip led the police to Surgeons Square and the body of Mary Docherty. The Hares were also arrested and the four were questioned over the next month. The police decided, that there wasn’t any real physical evidence to convict the foursome, offered the Hares the chance to turn King’s evidence and avoid execution. 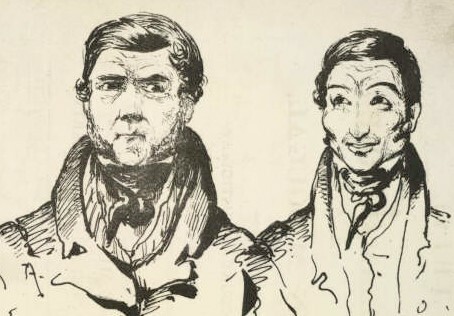 The Hares eagerly agreed, so Burke and MacDougal were charged with Mrs. Docherty’s murder and Burke with the murders of Jamie Wilson and Mary Patterson. On Christmas Eve 1828 the trial began with both of the Hares along with other witnesses testifying against the pair. The jury was shown items of clothing from the victims, and Jamie’s snuffbox. The jury took just 50 minutes to reach a verdict of guilty for William Burke and not proven in the case of Helen MacDougal who was set free. 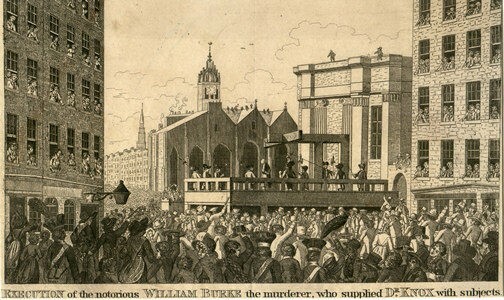 William Burke was sentenced to hang and his body to be publicly dissected. “After the execution, the body was cut down and given by the Town Council to Professor Munro, in the College, for dissection for the instruction of his students, to the knife, where he had sent many a poor victim before. Such is the Nemesis that follows crime. All the day (Wednesday) dense mobs crowded round the College Buildings, and knots of people went listlessly through the streets, as if justice was only half done. A universal discontent reigned for allowing Hare to get off scot-free. It was thought by some that the mob might try to get hold of the body of Burke. So for safety it was removed from the Dead House to the dissecting-room, and early on Thursday morning many famous scientific men called to have a glimpse of the body previous to the students crushing in, such as Sir W. Hamilton, George Combe, the famous phrenologist; Mr. Linton, Dr. Christison, and others. Some made sketches of the body. Then the stream of students poured in, and the body became the subject of lecture, his head being sawed across to illustrate the lecture, which was on the brain. All was decorum in the classroom; but outside the College Yard, there had gathered a lot of young students not belonging to the Anatomy Class, and other young men, who began to clamor for admittance. To quell the disturbance, the police were sent for, which only helped to make things worse. Students have always shown impatience of being forcibly put down by the police, and a regular melee took place in which some of the police were worsted, and used their batons freely. The mob then began to smash the windows of the dissecting-room. Some of the students were captured by the police, but were as quickly recaptured, amidst the shouts of their companions. At last, after the intervention of some of the Town Council and Dr. Christison (who had arranged that permission would be granted to them to see the body of Burke in companies of fifty at a time), the disturbance was quelled at once, and turned into cheers. But it did not end here; for the people outside the College Yard Gate were more inflamed to gaze on the corpse of Burke, and bearing of the success of the students only stirred up to fresh efforts to gain admittance. They also threatened that they would force in, and at last it was arranged that on the following day (Friday) the body would become a public exhibition. The public came in at one door and, passing the corpse of the hanged man, passed out at another. A strange spectacle, ever to be remembered in the annals of crime! There Burke Lay on the black marble table of the dissecting-room: naked, horrible, exposed to the gaze of a living stream of his fellow men who passed at the rate, it was alleged, of sixty persons per minute After this unheard-of exhibition, the body was cut up for dissection. Some of the students, it was alleged, slipped away pieces of the skin, and got them tanned. In 1882 we had in our possession a pocket-book which was of it. It was dark, and just like leather. It was sold to one of the professors, who, we understand, made a present of it to the Anatomical Museum, New University. It had stamped in gold on it ‘Burkes Skin, 1829’”. The two women, Mrs. Hare and Helen MacDougal, eventually disappeared into obscurity but for a while were hounded wherever they went. Dr Knox was never charged with a crime but the Edinburgh citizens were angry at his involvement and there was a riot outside his house shortly after the trial. He eventually left Edinburgh due to dwindling uptake of his classes and his general unpopularity and moved to Glasgow and later London where he eventually died in 1862. William Hare, now a famous mass murderer who killed more people than Jack the Ripper, was set free and was last sighted in the English town of Carlisle. He was rumoured to have been seen up to forty years later as a blind beggar but this was never officially confirmed. Helen MacDougal returned to her house but was almost lynched by an angry mob. She fled to England but her reputation preceded her. She was rumoured to have left for Australia where she died around 1868. Margaret Hare also escaped lynching and reputedly returned to Ireland. Nothing more is known about her. The murders highlighted the crisis in medical education and led to the subsequent passing of the Anatomy Act 1832. It was just two months after the public execution of Burke that John Stewart graduated as a surgeon. Then he set sail. Surely the two are linked in some form of shameful ideation? Dr John was at sea for somewhere in the region of 12 months, but by 1831 had returned to Bridge of Allan where ‘for twenty years’ was to be the surgeon for the village. The doctor took his name from his uncle, John Stewart, who had married his mother’s sister Betty Black. Betty was one of Rabbie Burn’s six Mauchline Belle’s and it has been retold within the family that the flame Rabbie carried for her was never extinguished. Now family recollection can be biased, and one would guess no more so, than when it comes to our national bard – Rabbie Burns. It has been recorded in weighty tomes that these poems are attributed to others – there is simply no mention of Betty Black. However the parish records place the Black family at Rabbie’s door – of that there can be no doubt. The January 1754 marriage of John Black and Margaret Fleming (parents of Betty) holds the torch to Rabbie Burns. In the parish entry, John Black is described as the servant to the Earl of Glencairn of Dean Castle. Now in 2004, I took Sian, Andrew and Rachel to Kilmarnock – it was time to visit Dean Castle! There in the Dining Hall two large cabinets were devoted to Rabbie Burns, he was you must understand, the Earl of Glencairn’s closest of friends. In the photograph overleaf you see the attached Palace, next to the Keep. Look closely and you will see a bell and pulley to the door. 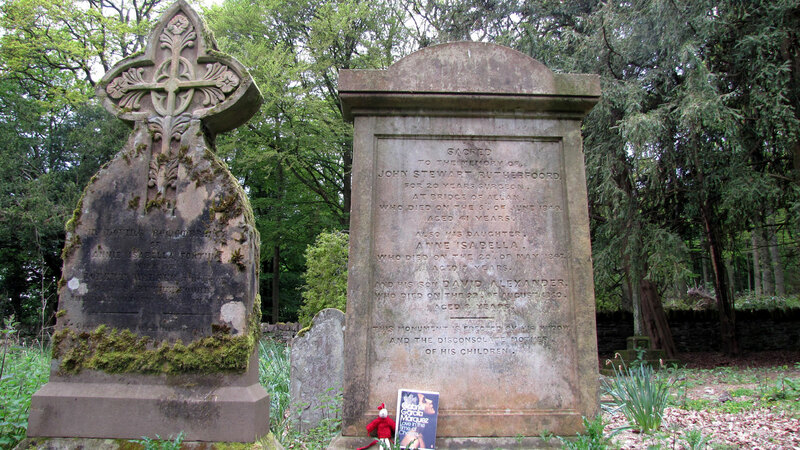 Stop and imagine it was Rabbie at the door – and along to greet him John Black the butler. Dean Castle is well worth a visit – the old vaulted Keep has the best selection of armour I have yet seen – it shines gloriously amidst an array of broad swords and shields. Rachel loved the playpark and the estate grounds which even had its very own farm. Andrew savoured the macaroni – at the time the best he had eaten! So there you have it: the Rutherfoord family had its counsel with the bard. That is a rich claim indeed, and Dr Rutherfoord must have been honoured to carry forward a family name in honour of the bard himself. While he was diligent and conscientious in the work of his profession, he, like, his father, had intellectual interests’ far outwith the boundaries of that profession. He was a devoted Church member and an elder in the Lecropt Kirk Session. But more than that, he had his father’s love of literature and of literary expression, for he too, was a poet, following his father’s footsteps in taking the sacred volume for his groundwork and producing a metrical version of the Song of Solomon. In 1846 a thunderbolt hit Bridge of Allan – a cholera epidemic which ravaged the village, and with grim persistence called on far too many doors. Dr Rutherfoord was kept very busy, but tragically he succumbed to the disease himself. Whilst still recovering, Dr Rutherford was very publicly declared bankrupt – with an advert to his creditors appearing on the front page of the Stirling Observer of summer 1846. Well regarded, the village and church responded to the ailing Dr Rutherford, and from 1846 he received £2.10s every six months from the Parochial Board of Lecropt for medical relief of the poor, and he was also instructed by them to give his orders to Mr. Charles Rutherford, his brother, for medicines. 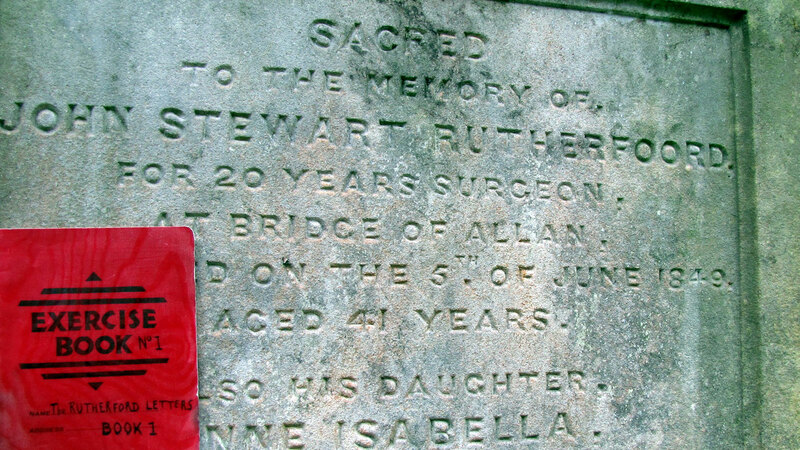 Dr Rutherfoord died in Mauchline just three years later. It was June 1849, and the doctor was aged just 41 years. For some poor families tragedy has that unspeakable habit of revisiting the afflicted. The doctor’s only christened children, his son David Alexander, and his daughter Anne Isabella, took their final bow and curtsey around the same time. Anne died 12 months before her father (aged seven) and David died 12 months after his father. He was aged eight. So in the space of three short years, David Rutherfoord and his two children were dead. What sadness. 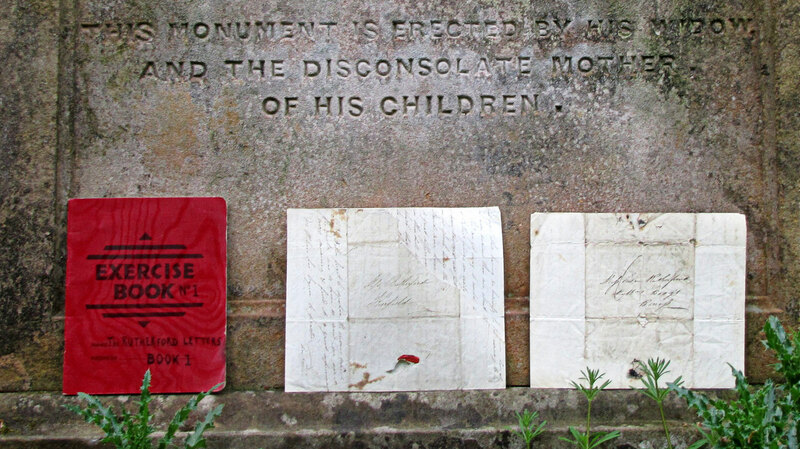 Perhaps then it should be the poor doctor’s wife we should remember first, for it was she, Ann Isabella Fortune, who raised a tombstone in Old Lecropt in memory of her dear departed and infant family. A tragic irony then that she carried the family name Fortune, for she could not have had less.